Uses Because ash is the toughest native timber, it was traditionally used for making weapons - spear handles - and agricultural tools. Suitable for furniture making, with excellent bending properties, therefore ideal for parts of chairs. Also used for sports goods, e.g., for the handles of tennis and other racquets. Can also be used for interior joinery, e.g., for stairs. 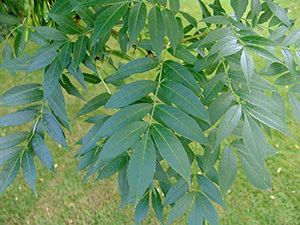 Availability of Scottish Ash Ash is widespread in Scotland, growing well in both upland and lowland woodlands. Planks will usually have a fair amount of colour in the heartwood, in contrast to paler European ash. Ash is available from most ASHS members. 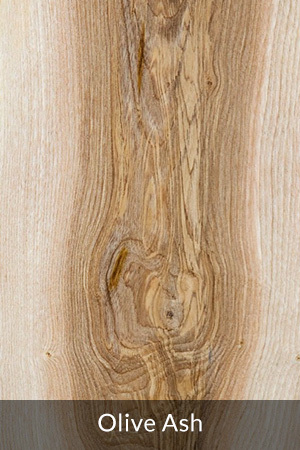 Boards of Scottish ash are typically between 2 and 4 metres long and up to 500mm wide, although they often split from the bottom. Strength Comparable to European Beech, but famed for its toughness—ash is the toughest native British hardwood—meaning it has the best resistance to shock. Slow grown ash will be less strong than ash that is grown at an average rate, as it has a higher proportion of porous early wood. Density Variable according to growing conditions, from 510-830kg per cubic metre: average density is 690kg / cubic metre. Durability and Drying Heartwood is perishable and liable to attack by forest longhorn and Buprestid beetles. Also liable to attack by powder-post and common furniture beetles. Should be dried slowly to minimise distortion; doesn't tend to split or check, but will crack from the base. Structure Ash is ring porous, with growth rings distinguished by early wood vessels and terminal parenchyma. Parenchyma are generally yellow in contrast to wood fibres that are pinky brown. Late wood vessels not visible to the naked eye. Ash rays are fine and inconspicuous. Colour and Figure White to light brown, sapwood not distinguishable from heartwood, sometimes irregular dark brown heart. 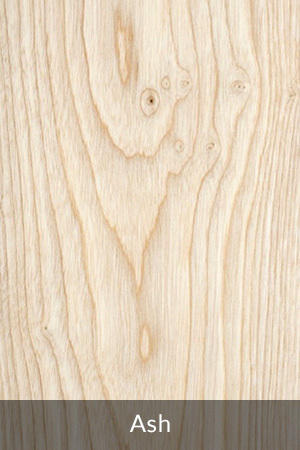 Figure characterised by contrasting early and late growth, particularly in crown cut boards. Working Properties Moderate blunting on tools, generally satisfactory sawing - some tendency to bind when green - also satisfactory machining and gluing. Pre-boring required for nailing. Ash finishes smoothly and takes all finishes well. Looks and Leaves Potentially a very tall tree, up to 43 metres, but more typically around 12-18 metres tall. It's broadly conical with an open canopy. Ash bark is pale grey and smooth in young trees, becoming furrowed in ridges as the tree ages. Leaves are up to 300mm long, pinnate, with 7 to 13 stalkless leaflets on a central stalk. Leaflets are elliptical, with toothed margins and are between 15-120mm long, dark green above, pale below. The leaves open late and fall early, while still green. 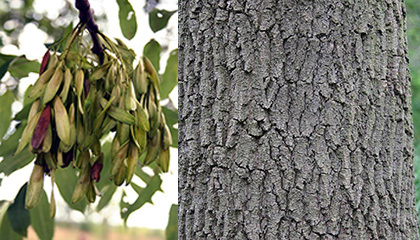 Ash buds are conspicuous and dark; the flowers are small and purple, have neither petals nor fragrance, occurring in auxiliary clusters, which open before the leaves. Pollination and seed dispersal takes place by wind; ash seeds may stay viable for up to 6 years. Habitat Relatively intolerant of cold in winter. Seedlings have a tolerance of shade; favours moist soils and won't grow on very acid or poor soils. 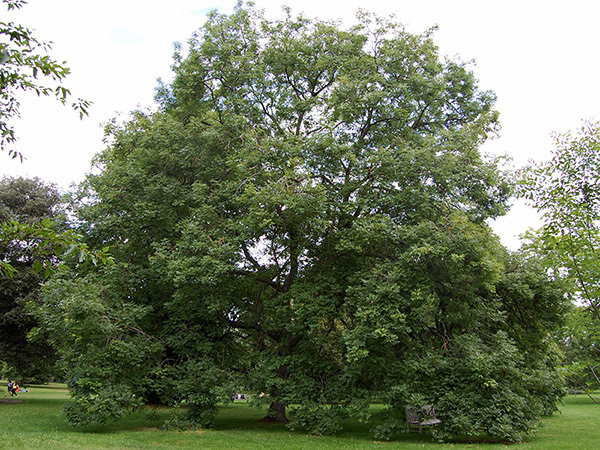 Ecological Value Ash is a hospitable tree - at least 68 phytophagous invertebrates are associated with ash as well as insects from five families. Seeds are palatable to mice and voles. Fruit form an important part of the diet of bullfinches before egg-laying.